(NewsUSA) – When it comes to entertaining a child, it’s hard to beat what nature has to offer. Most kids love taking nature walks and trips to aquariums and zoos, and parents can rest easy knowing that these sorts of trips have an educational impact. –	Studies show that children with access to nature suffer from less depression and stress, and are less likely to develop obesity. Exposure to nature may also boost kids’ attention spans, making them better learners. –	Seeing nature makes children more interested in the outside world. According to one report, most eight-year-old kids can identify more cartoon characters than wild animals. –	When children experience wildlife firsthand, they can better understand why conservation is important and how even the actions of land-locked states can help or harm the environment. Regardless of where you live or vacation, there are many opportunities for children to see wildlife up close. Take sea turtles for example: according to Oceana, an international organization that focuses on ocean conservation, the United States is home to six species of sea turtles, all of which are in danger of extinction. 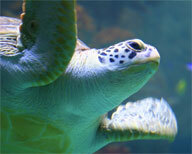 Unlike many ocean creatures, which require a boat or scuba gear for viewing, sea turtles are easily accessible. Children in landlocked states can see them in aquariums, while children with access to coastlines may be able to see sea turtles in the wild. Some state and national parks lead moonlit nature walks, where children can see female sea turtles lay their eggs on the beach. Female sea turtles go into trances when they lay their eggs, so under a ranger’s supervision, children can come within a few feet of a wild sea turtle. Children can also often see wild sea turtles swimming in locations like Florida, Texas and Hawaii. People of all ages are more likely to want to help save sea turtles once they’ve seen one up close. For more information, visit www.oceana.org.